Gambia (pop. 1,589,000; GDP/cap US$322) is the smallest country in Africa, located on the coast of West Africa, surrounded by Senegal in the north, south and east. 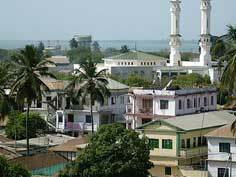 Gambia gained independence from the UK in 1965. In 1994, there was a military takeover and it was not until early 1997 that the country returned to constitutional rule. Yahya Jammeh is the current president of Gambia. Gambia's economy is heavily reliant on peanut exports and livestock. Unemployment rates are extremely high. Corruption has prevented foreigners from investing in the country. A number of arrests and convictions of high profile politicians and government officials have taken place, some of whom are members of Jammeh's own party. Rental Income: Rental income earned from leasing residential properties is taxed at a flat rate of 8%. Capital Gains: Capital gains may be taxed in two ways: either net gain is taxed at 15% or gross selling price is taxed at 5%, whichever method yields a higher tax liability. Inheritance: There are no estate duties in Gambia. Residents: Residents are taxed on their worldwide income at progressive rates, up to 30%. Married couples are taxed jointly on unearned income. Total costs of buying property are around 7% to 8% of the property value. The buyer pays for the 5% stamp duty and the legal fees (2% to 3%).